Mixing cocktails is simple, social, and above all FUN with our inspirational cocktail gift, designed to help any aspiring mixologist get their groove on at the bar! 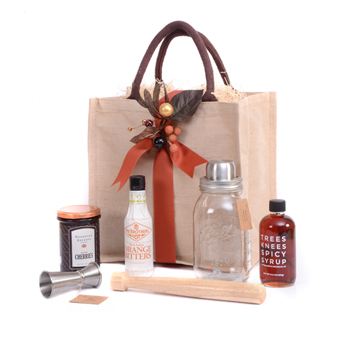 Tucked inside our handsome, reusable jute tote is The Mason Shaker.....an oh-so-cool repurposing of the iconic Southern classic - the mason jar. The 32 oz. glass and stainless steel shaker is as handsome as it is useful, allowing the user to shake their way to classic cocktail stardom. We've paired it here with a natural hardwood muddler. At 10 inches long it provides just the right amount of leverage when muddling ingredients in the shaker. A custom designed stainless steel jigger is a key element of any bar, and the one shot (1.5 oz) / half shot (.75 oz.) measure will guide cocktail concoctions to success every time. The fun ramps up further with three classic cocktail ingredients. Orange bitters were at one time a staple in most bars, but until recently have been hard to find. Those from Fee Brothers are made from the skin of bitter oranges from the West Indies. Complex and fruity, they work well when dashed in to an old fashioned, a martini, a margarita, and citrusy rum drinks. The adventuresome cocktail enthusiast will add a touch of heat and a ton of flavor with Trees Knees Spicy Syrup. From organic maple syrup infused with chili peppers, it's a perfect balance of sweet and spicy, and steps in for Triple Sec in a heated margarita. The garnish plays a starring role in any bartender's repertoire, and we've included a jar of the best. Woodford Reserve bourbon cherries have a gorgeous, deep ruby color and bring a hint of Kentucky's finest bourbon to your cocktail. They are also a favorite as a topper for many desserts. Ideal for bar showers, housewarmings, or when you need to say "thank you" or "congratulations", this hip gift will be appreciated, cocktail after cocktail. 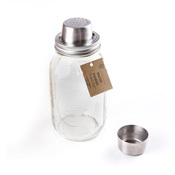 W&P Designs - The Mason Shaker: Crafted from glass, stainless steel, and a whole lot of Southern sensibility, this useful shaker is inspired by the classic mason jar. W&P Designs - Muddler: Sleek design in a 10-inch hardwood muddler, providing the right amount of leverage for muddling ingredients in the shaker. W&P Designs - Jigger: A bar essential of stainless steel with one shot/half shot capacity, for a perfect measure every time. One shot (1.5 oz) / Half shot (.75 oz) measure. Mixed Made - Trees Knees Spicy Syrup: Organic maple syrup infused with a mix of chili peppers for a perfect balance of sweet & spicy. Kicks up any number of cocktails and does double duty at the grill. Fee Brothers - Orange Bitters: From the bitter skin of oranges from the West Indies. Adds unparalleled depth of flavor to clear-spirit cocktails and pairs well with any number of savory sauces. Bourbon Barrel Foods - Woodford Reserve Bourbon Cherries: Ruby red cherries with a hint of Kentucky's best bourbon......an ideal cocktail garnish or dessert topper. Reusable Jute Tote Bag, 12" x 12" x 7 3/4"